A school in Norway has replaced chairs with large rubber exercise balls and the pupils love it. Dag Voigt, the headmaster of Bjerkreim School in Rogaland, south of Stavanger, decided to experiment with the balls with two classes after a local physiotherapist Tore Jakobsen came to him with the idea. The children quickly developed better core muscles and stronger backs, without any adverse impact on their studies. 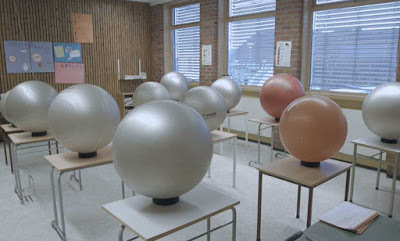 The school now uses balls instead of chairs for all pupils between the ages of 10 and 13 , arguing that as the balls are actually cheaper than chairs, it is not a major additional cost. Jakobsen said that the benefits appear to come simply from increasing the movement children made during lessons. “It’s to get more movement into the every day in school, that’s basically the thought,” he said. “The more movement children get into their day the better, but none of this has been scientifically proven.” Pupils at the school all said they liked having balls in the classroom. There's a five minute film, in Norwegian, here. It should be better for your back and bum. But if you doze off--as I have been know to do in various classes--it means injury and probably a trip to the surgeon's (Britspeak; doctor's or ER in Amspeak).